Second round of Radegast Lihen 2014. 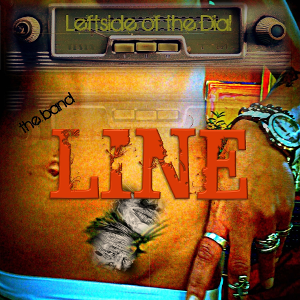 Recording debut album Left Side of The Dial. Hudba z FEKTu 2013 music festival. First gig ever... at the end of the world - 2012/12/21! Summer open air gig in garden U Pecivalu. Second time in Brno at music club A2. Successful first round of Radegast Lihen 2014. The Band LINE (also known as LINE) is a four-member alternative rock group from Ostrava, Czech republic. The foundning members Jan Vantuch (guitar), Tomas Zatek (bass) and Jan Bijota (drums) got together with british painter David John Lloyd (vocals, sax, mouth organ) in the beginning of 2012. The band started rehearsing and writing songs in Lloyds house and on November that year released 7-track demo Faithless which was recorded in TdB Studios in Ostrava-Martinov during one autumn weekend. The band's first performace on 21st of December 2012 took place at club Klid (Ostrava) where LINE played all songs from Faithless with some other unreleased tracks. In 2013 the band gained experience on its live gigs. LINE attended, e. g. music festival Hudba z FEKTu 2013 in Brno. In march 2014 LINE attended band competition Radegast Lihen 2014 and managed to win the first round in U6 club (Ostrava). Later that year former bass guitarist Tomas Zatek was replaced by Marek Zeman (known from his solo project Marow or David Stypka & Bandjeez). In may 2015 the band with new bassist Marek had several recording sessions in studio Mros in Ostrava. On November 13th 2015, debut album Left Side of the Dial was released. The same year in October Marek had to leave LINE due to his lack of time. The band chose Radek Koval (known from Cocaine Party or KOFE-IN) as his replacement. Radek had played with the band until the summer of 2017 and then his place as bass guitarist took Pavel Tománek. During 2018 the band is working on a new material for second album and trying the new material live on gigs in Brno, Opava and Ostrava. Debut album Left Side Of The Dial was recorded in studio Mros in Ostrava during summer 2015. This debut record is influenced by 70s rock bands, psychedelia and artists like Tom Waits or Nick Cave. Information about our upcoming gigs can be found on our Facebook events page.